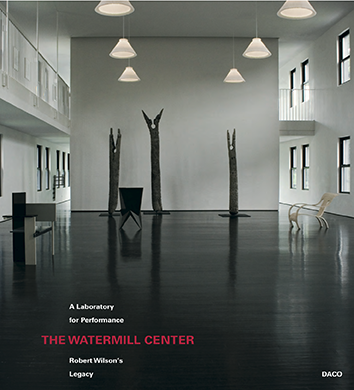 The Watermill Center and Daco-Verlag are pleased to announce the release of The Watermill Center – A Laboratory for Performance: Robert Wilson’s legacy. The book, published to coincide with Wilson’s 70th birthday and the 20th anniversary of Watermill’s founding, is comprised of almost 100 newly written texts by over 80 contributors and more than 450 images, most never-before published. This compendium of documents, texts and images includes forwards by Jessye Norman and Pierre Bergé and contributions by artists Marina Abramovic and Jonathan Meese, long-time Wilson collaborators Lucinda Childs and Philip Glass, performers Isabella Rossellini and Isabelle Huppert, curators Chrissie Iles and Elisabeth Sussman, singer-songwriter Rufus Wainwright, scholars Antonio Damasio and Bonnie Marranca, collector Jean Paul Barbier-Mueller, writers Jay McInerneyand Barbara Goldsmith, as well as many Watermill Center alumni artists. Covering every aspect of life at The Center, Wilson’s summer workshops, the year-round residency programs, the extensive-collection, outreach programs with community, landscaped gardens, and architecture, this is the first extensive glimpse into the world of Watermill and an intimate look at Wilson’s artistic process and the legacy he is creating for future generations. The book was edited and compiled by José Enrique Maciàn, Sue Jane Stoker, and Jörn Weisbrodt.